With more than three decades of clinical experience and over a million patients treated, statistics confirm a success rate of nearly 95 percent for single dental implants, and even higher for the bridges they support. All of the doctors at Brookline Periodontal Associates have specialty training in the surgical placement of dental implants. When you visit Brookline Periodontal Associates you will know our staff is devoted to your personalized attention. The doctors can discuss the best dental treatment plan to address your concerns. Today, state-of-the-art guided surgical techniques are convenient alternatives to place dental implants and allow you to have the dental implant placed in a single session . This new method has significantly simplified the procedure, for both patients and dentists. The major advantage of the guided surgical technique is the minimal amount of manipulation of the soft tissue . This significantly reduces the healing time and the discomfort normally associated with traditional dental implant surgical techniques. With any surgery, there can be some post-operative discomfort but you should be very comfortable during the procedure itself. 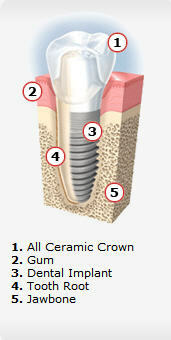 Anesthesia and patient sedation are commonly administered to eliminate discomfort during the dental implant process. Most patients report that they were much more comfortable following the procedure than they had anticipated. Your doctor will prescribe medications to ease any post-operative discomfort that may occur. Ask your dentist to recommend another patient who has already had tooth replacement therapy to assess their personal experience.